Alright! I got some goodies from Krush Nutrition to try out, including their Nutty by Nature Peanut Butter, made with whey protein, flax and chia, as well as their Krush Bars in Raw Cookie Dough and Birthday Cake flavor. Let’s begin! 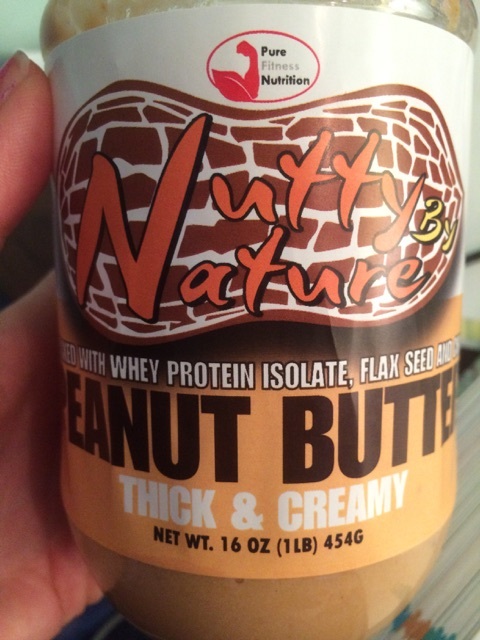 Naturally (no pun intended), I started with the Nutty by Nature Peanut butter. Oh…it’s been a while for me and peanut butter. See, we are good friends…but he is evil, and I end up eating the whole jar in 3 days or so…BAD. So we argue and we fight and I’m mad, and then I don’t buy it for weeks, sadly pass by it on the shelves…and somehow he always comes back! LOL. What can I say I love nut butter. Here’s what it looked like! 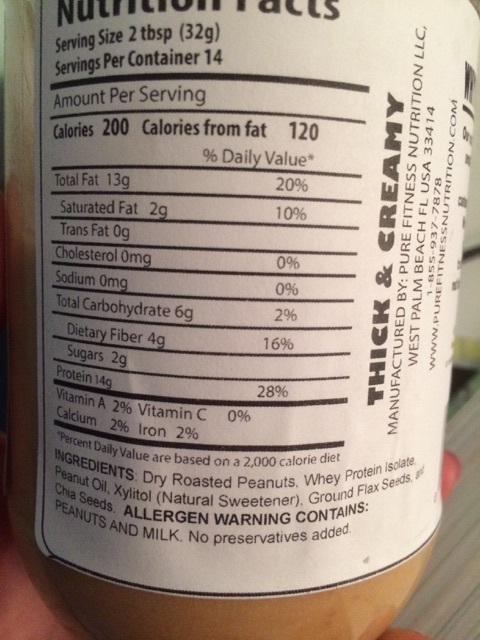 Anyway, this peanut butter…ah-mazing. So good I had to keep it in my roommate’s room so I wouldn’t eat the whole dang thing in a few days (I wish I was kidding). 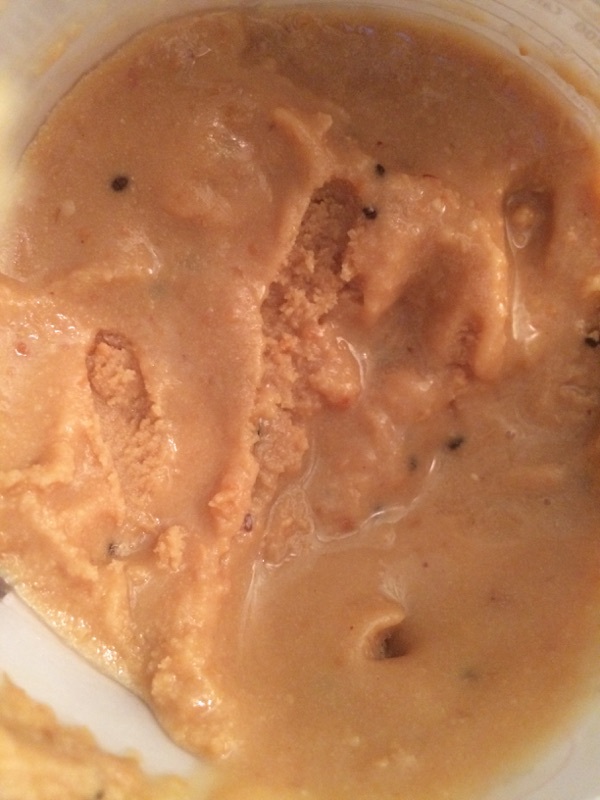 It is sweet and creamy, but has some texture to it. You can taste the sweetener, but it’s good, it’s xylitol, and I can guarantee that because I am a diabetic and I know my sweeteners! However, only 2 grams of sugar, despite the sweet taste. I really, really loved this nut butter, dangerously good if I do say so myself. You can tell there is something mixed in it, most likely the whey protein, but does not take away from the flavor at all. It gets a teeny bit pasty at the end of the jar, but I’ll choose my battles. This thing tastes like the inside of a Nutter Butter cookie. UGH! SO GOOD! 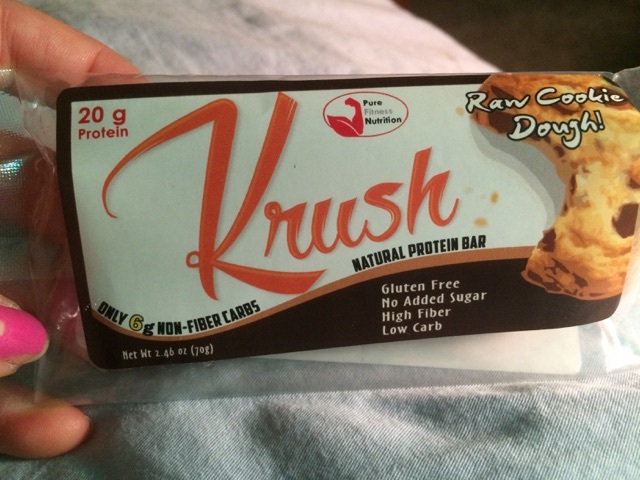 Moving on… Krush Bars! 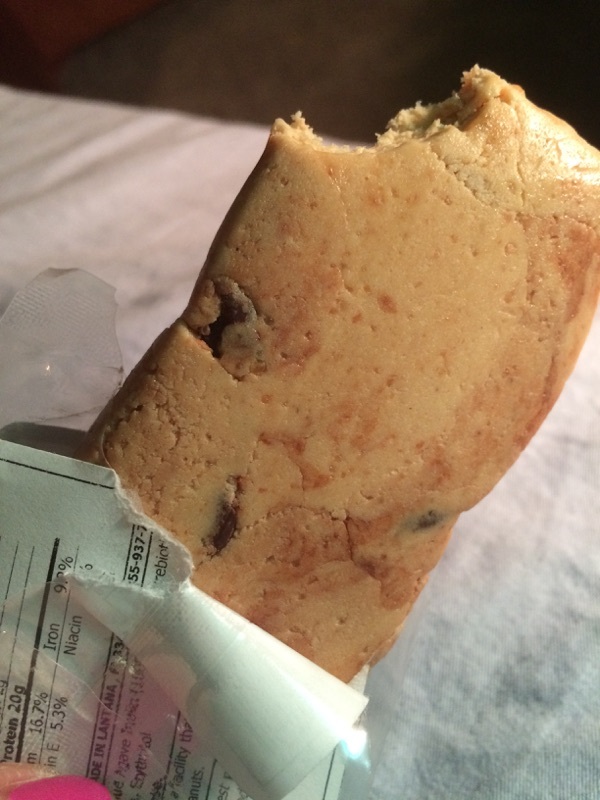 There are gluten free, protein bars, loaded up with fiber. 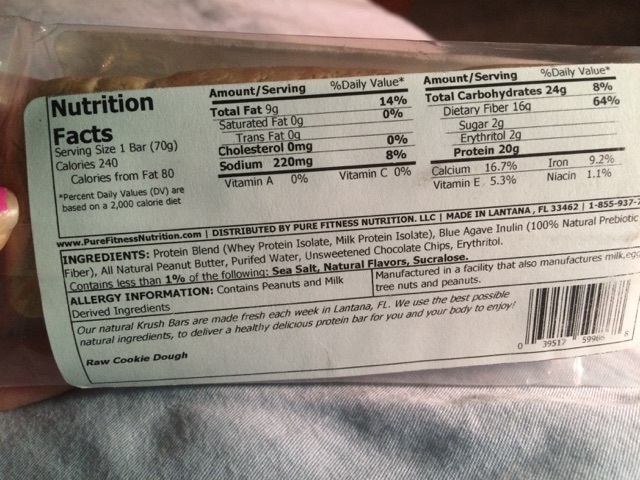 The stats reminded me of a Quest bar, which I took a picture of below. 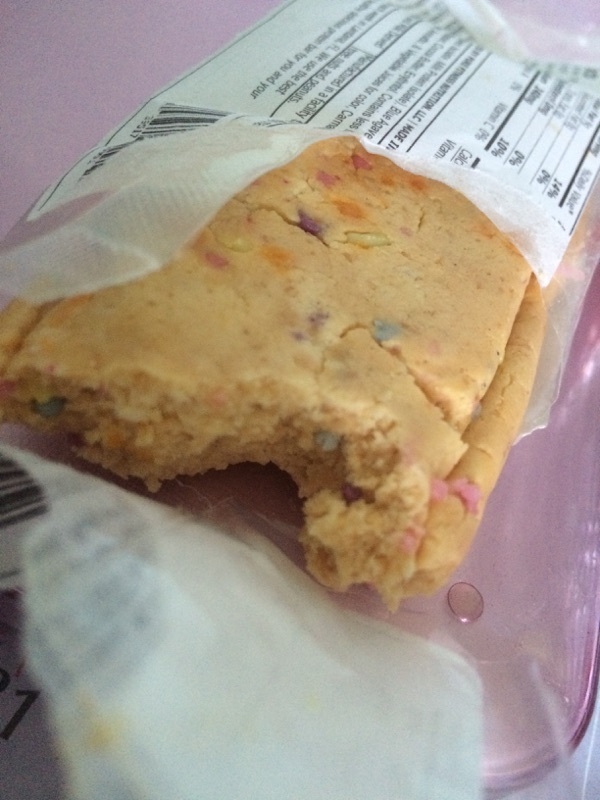 And…here is the Birthday Cake bar up close. CHECK THOSE SPRINKLES!!! Sponsored, unbiased post. I received these items for free.